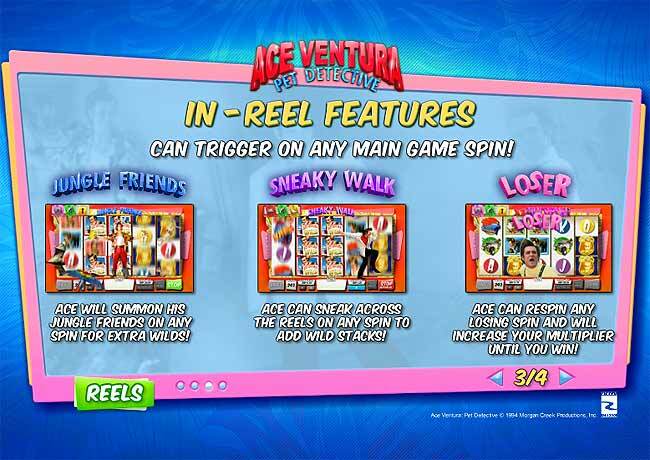 Another film revival from Playtech and Ash Gaming as they release Ace Ventura Online Slot. This is based on the 1990's film starring Jim Carrey as the bungling pet loving detective. This is a good game with many fun bonus features. This is a five reel video slot game now available in onine casinos. There are no fixed paylines just get wins for matching symbols on adjacent reels, there are 243 wining ways with five reels and three symbols per reel. During normal gameplay you choose your coin size and bet amount then spin the reels. The symbols are based on the main character and the silly situations he finds himself in. You will also notice that ther are prset modifiers shown at the top of the screen. The some into play during the free spins bonus game. The game offers several free spin modifiers. You can also un;ock a third modifier to make your bonus game even more profitable. The modifiers will update when you spin the reels and get a noew modifier, it will replace the first modifier. Keep spinning, unock the third modifier and the hope to get the bonus. There is a WILD SYMBOL and Modifier Symbols with keys to unlock the third modifier. There are three in game mini features that are triggered randomly. JUNGLE FRIENDS, SNEAKY WALK and LOSER can all win you extra instant cash, and are quite fun with great sound effects. There is the BONUS symbol and spin three of these scattered in any position on reels 1, 3 and 5 will start the free games bonus. 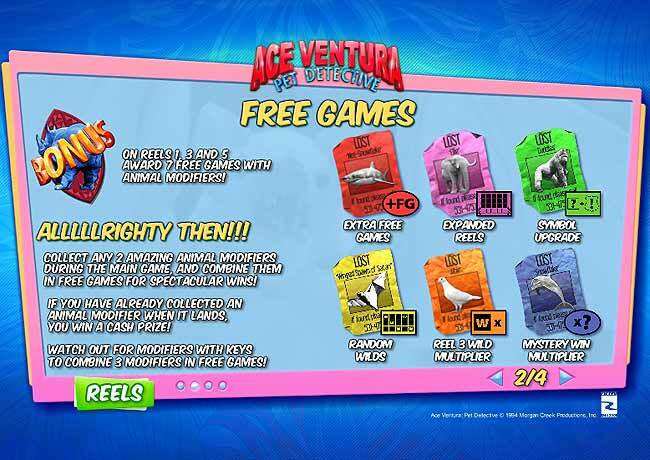 You are awarded initially 7 FREE GAMES but you also get the animal modifiers. The animal modifiers can grant extra free spins, extend the reels so there are 4 symbols on each reel to give 1024 ways to win, you can get extra wilds and expanding wild reels. All modifiers you have locked will become active during the free games.